The birth of a baby is usually a time of great joy and happiness for the parents. The event also creates a birth record, which is kept on file with the state and used throughout the baby's life for a variety of reasons. It is necessary that a birth certificate include accurate and reliable information about the child and his parents. If there is an error or omission on the birth certificate of a child born in New Hampshire, you can correct the certificate through a fairly simple process. In New Hampshire, a person with a direct interest in a birth certificate may apply to have an erroneous certificate corrected. A person with a direct interest includes the person whose certificate needs the correction, or one of the parents or legal guardians of that individual. If the registrant is 18 years of age or older, he must request the change himself or approve the change if someone else submits the application. If there is a father listed on the birth certificate and the certificate needs correction due to an error in the father's name, you can submit an application to correct the birth certificate to the office of the clerk in the town where the birth took place. You will most likely use the form, Application for Correcting or Completing a Certificate of Birth, Marriage or Death, to request the correction. You must completely fill out the form, sign it and have it notarized. You must also pay a processing fee for correcting the certificate when you submit the application. If, however, it is necessary to change the name of the father on the birth certificate because the wrong man was identified as the natural father, you'll need to complete an affidavit of paternity. When a baby is born in New Hampshire to a single woman, the hospital where the birth takes place will try to have the biological parents complete an affidavit of paternity. The hospital transfers the information gathered on the affidavit to the birth record, which is used to create the birth certificate. In the affidavit, the baby's father is acknowledging paternity and accepting legal responsibility for the child. If this form is not completed in the hospital, the birth record is sent to the records division with the phrase “not stated” where the father’s name would otherwise appear. If the parents choose to correct the birth certificate later by adding the father's name, they need to do it before the child turns age 18 by filing the affidavit of paternity with the clerk of the city where the child was born. The person listed as the father needs to sign the affidavit and have his signature notarized. In the case where a woman seeks to add the name of a deceased man believed to be the natural father, the mother must present the affidavit of paternity in the form of a petition to the local district court before submitting it to the local clerk's office. Once the affidavit is received, the clerk's office will add the natural father’s name, date of birth, and place of birth to the baby's birth certificate, and no further action is necessary. When a married woman gives birth in a hospital, and indicates that her husband is not the natural father of the child, a slightly different process is used to correct the birth record. The mother, natural father, and husband must all sign what is called a 3-party affidavit of paternity form, with each signature notarized, and submit the form to the clerk of the city where the baby was born. Upon receipt of the 3-party affidavit of paternity, a corrected birth record is created for the child that includes the natural father’s information. The natural father can actually sign the affidavit before the baby is born, but the mother cannot sign until after the birth of the child. 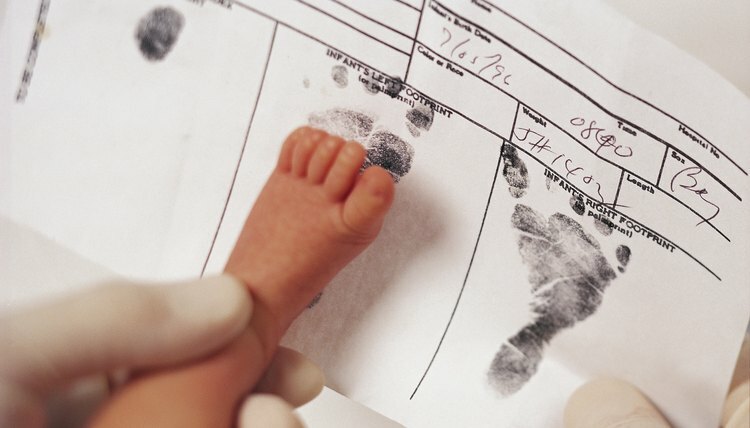 How Would My Newborn's Birth Certificate Be if I'm Not Married to the Dad?